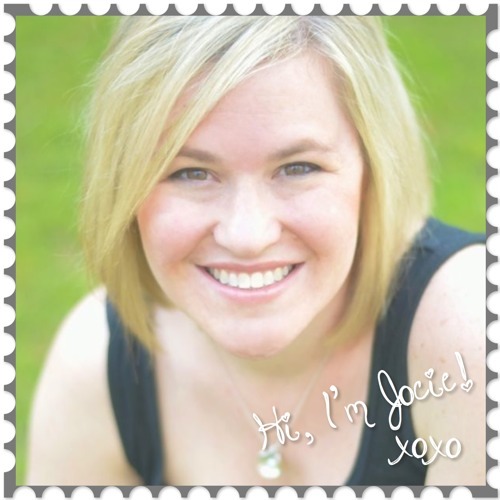 Hi, I’m Jocie (pronounced Jah-see) from The Better Half. My blog is one half of a home improvement website called One Project Closer, run by my husband. Obviously, mine is the better half. Hee Hee. At OPC and The Better Half we love to show you how we DIY our way through life, while we strive to provide you with the most up-to-date coupons from Home Depot so you can keep doing those projects you love. I hope this isn’t the last time I see you, so stop on by and say hello! You can also follow me on FB, Pinterest, and G+ for all the latest projects and adventures. Today I’m going to share 5 easy home decor ideas with you! I don’t know about you, but I get really bored really fast with my decor. With two young kids at home, I don’t have the time for a major overhaul of every room every couple of months, so I have five tips and tricks for you that I have used to help cure my boredom. I love pallet signs. Seriously. I may be a bit obsessed and make as many as I have time for, mainly because pallets have such a big impact for very low cost. 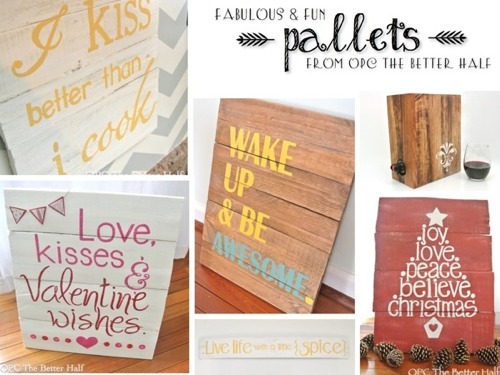 If you haven’t made a pallet sign before, I promise it’s not as hard as it looks. With the right tools, making a pallet sign can be fairly easy! I have hated our dining room chandelier since we moved into the house 7 years ago. 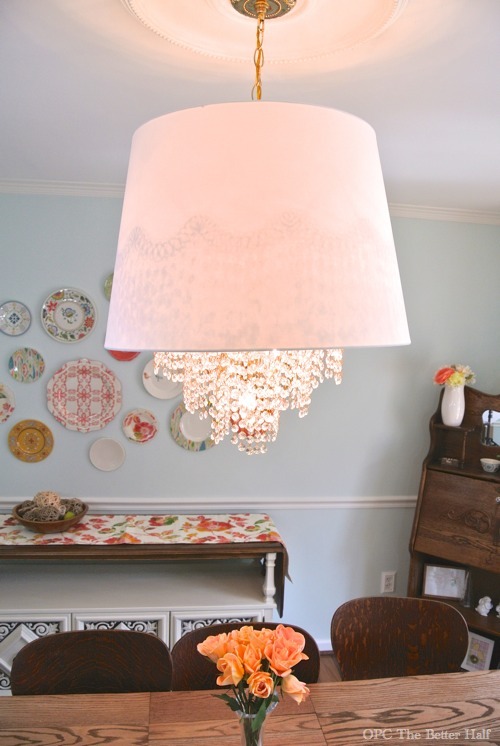 Then my cousin was going to get rid of her super gaudy chandelier, and I quickly claimed it and added a $30 IKEA lampshade to it. It looks amazing now. In addition to adding a shade to a plain lamp, I have often switched lampshades between rooms to give the room a new look. I have added scrapbook paper to so many different letters, wooden figurines, shelves, and frames using ModPodge. 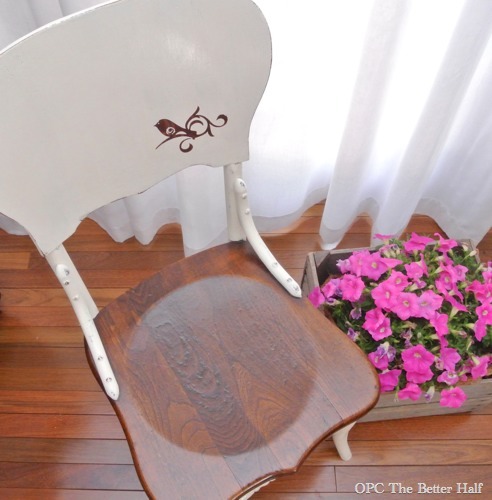 It is a super cheap way to add color and design without all the work of stencils. I used a good bit of ModPodge and scrapbook paper in our dining room, on the letters EAT and behind the custom spice rack the hubs made for me. This is probably my favorite little corner of the house. Okay, this is seriously the easiest project ever and has such a big impact considering the cost. 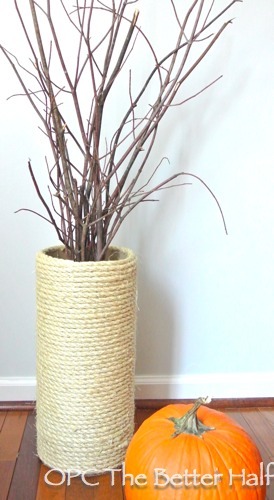 I used cardboard concrete forms from Home Depot along with sisal rope and made this vase for under $20! Crazy, right? I also usually decorate the branches according the season. What do you think? 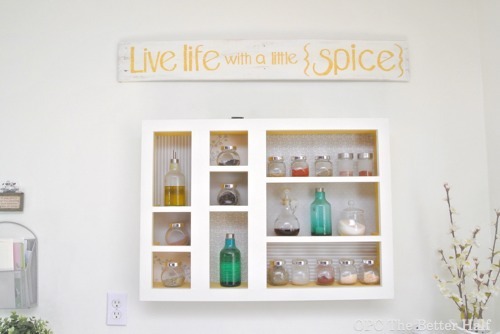 How do you change-up your decor on the cheap? Thanks so much to Jessica for having me and I hope to see you all again soon! How amazing is she???? 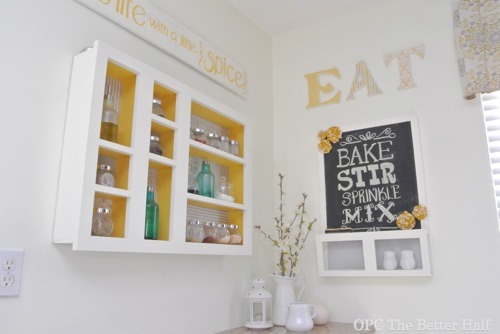 I am in love with every one of her projects, but especially love the EAT sign!